Sunday night we pushed and pushed and actually got the bathrooms finished. Thank you Natas for those amazingly delicious xtra large afternoon coffees, we couldn’t have done it without you! Here’s a refresher of what we were starting with. No words for it but NASTY! Nasty no more…..Feast your eyes on the afters! New flooring, new walls, new plumbing, new ceiling, new tub, new toilet, new surround, new fixtures, new baseboards. New New New!!!!!! Can you tell I am proud of what we have pulled off?! and now for the mainfloor! 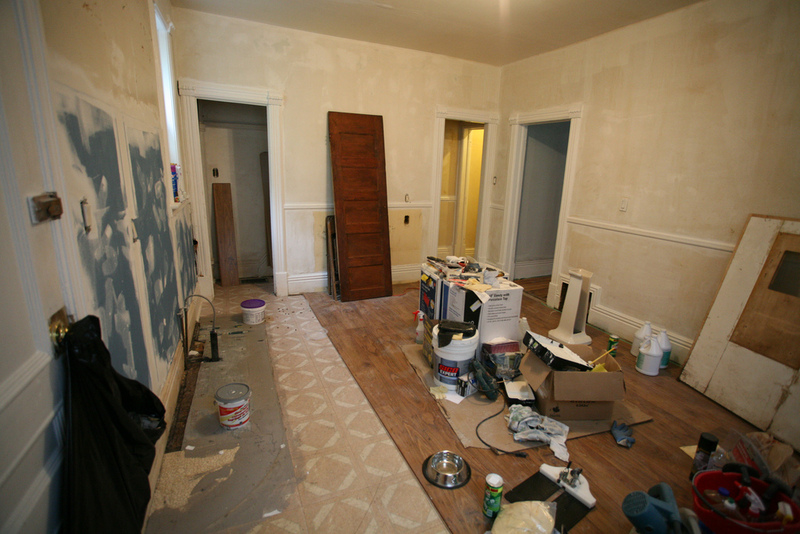 When we first saw the house there was no main floor bathroom, just a place under the stairs to put junk in. This is how it looked in all it’s busted up walls, rotting floor and failing plaster glory! and now we have a new two piece that matches the period style of the house! I know! I can’t believe that this is FINALLY coming together as well! This upstairs bathroom was epic, sooo many joints and seams to tape and sand. So many uneven levels and surfaces, so many corners to miter and fit….soooooo hot and stuffy to work in. But look! Look at great it turned out! Next week we will install the vanity, fit the floor grates, and put up the mirror, shower curtain rod, and towel bars. 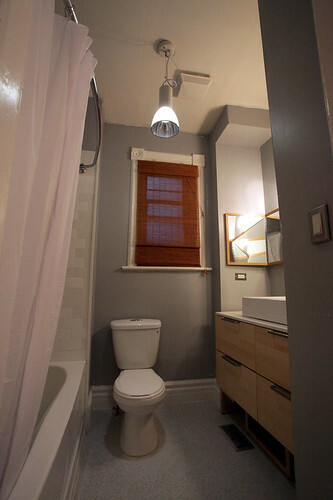 Check here if you need a refresher on how this bathroom used to look! HUGE STRIDES! We also have 3 of the 4 large bedrooms patched, painted and fans installed now as well. Curtain rods, blinds, wall plate covers and storage/shelving will go up in all of these rooms next weekend. 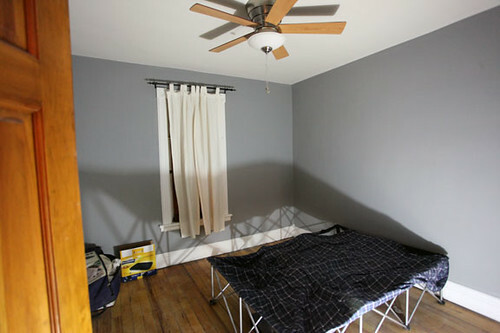 and the little front bedroom with the most drywall work is almost ready to roll as well. This room had a horrible built-in bunk bed/desk combo(the former owners solution to dealing with sagging plaster)that needed to come out. We repaired the walls right down to the lathe, rebuilt the baseboard trim and installed an overhead electrical box so we could install a fan which also meant a bit of tricky ceiling mud and patching. We ran out of natural light so the fan blades will have to wait for next weekend. This room may be the smallest, but it has the best breeze and the window looks out into the crown of the maple tree. I think its my favorite. Last but not least, we hooked up the paint sprayer and went to town in the hallways, upper and lower! Good bye depressing diarrhea brown walls. Hello Clean and Fresh foyer! It seems a bit stark with all the endless white, but I have to keep reminding myself that the punch of colour is on its way! Can’t wait to get the floor and stair paint on there, so lets see what you got to throw at us August, we can take the heat! Just off the kitchen (and under the stairs) was a long and narrow space the past owner was using as a closet to store trash and broken bikes in. Seemed like such a waste so we decided to put in a powder room. Laying the tile floor in this room was one of our first jobs but the walls were in such bad shape we had to do some pretty extensive drywall work . Once that was done Dale could plumb in the sink and toilet, install baseboards and trim and run some electricity. These walls took 5 rounds of mudding and sanding, but last weekend we were FINALLY ready to put some paint on the walls. We still have to fasten the mirror to the wall, put up a towel bar, curtain rod and other small stuff, but we are far enough along that I can say we’ve got ourselves a powder room! Love these etched tiles, the scale has a contemporary feel but the cascading floral pattern is a definite nod to the Victorian era . It was a nice splurge for a small room, $10 a tile from the Ottawa restore. The Chicago style Pedestal Sink features a geometric shape and a beveled edge, making it work well with both the era of the house and the contemporary design style we are going for in the rest of the joint. The wide faucet deck provides plenty of room for soap and other toiletries and the built-in back splash should keep the walls safe and dry. 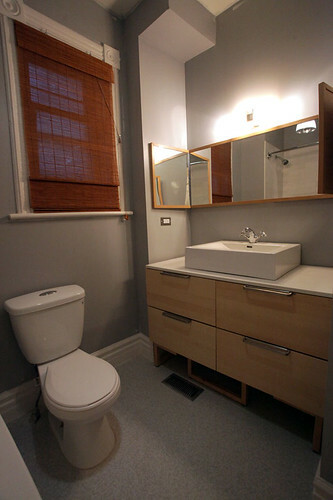 The sink was purchased at a Toronto restore for $125 and included the taps, can’t beat that. 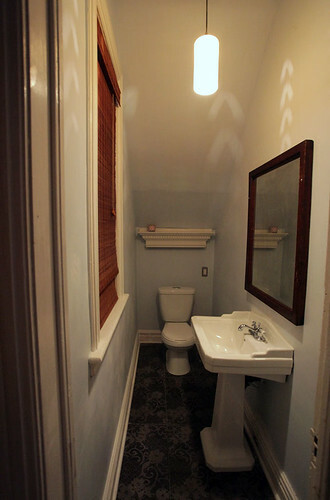 The shelf above the toilet was an original mantle taken out of a Cabbagetown home and scooped up on the annual yard sale weekend. I’ve just put the paint order in and there’s no turning back…blue stairs it is! Last weekend Dale hooked up the paint sprayer and we covered the front hall top to bottom with a soft milky white. It’s looking a little plain right now but once we coat the stairs in the F&B Hague Blue it’s going to be lovely. The colour is just so rich and deep, I think it will be amazing with the orange tones in the wood handrail and spindles we are leaving unpainted. Depending on the time of day the stairs and floor will change from deep, rich saturated blue through to the darkest shade of inky midnight. Lovely! As for the back staircase….the space is so narrow but has really high ceilings so I think it best to treat the stairs as an architectural feature and go really modern with a coat of bold colour. I like the impact this treatment has, our back staircase leading from the 2nd floor to the kitchen is just as angular. This turquoise colour however isn’t really doing it for me. I am pushing for orange, F&B’s Charlotte’s Locks to be exact. 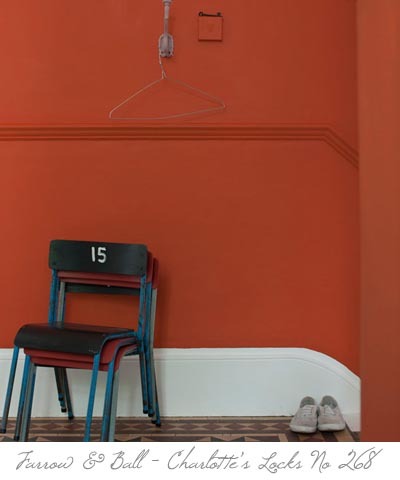 Orange is a tricky color to get right in paint but Farrow & Ball pretty much nails it though. What can I say, I love the color orange. I can’t get enough of this bold burnished orange and how crisp and clean it looks next to white. 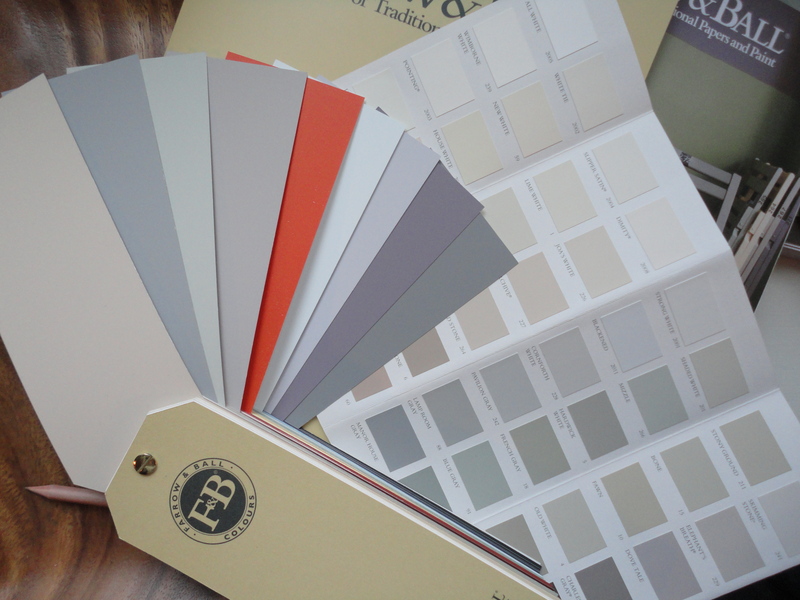 Plus it goes so well with the soft greys palette we have chosen for the kitchen and living room. it’s so nice to be able to think about design decisions now that a huge chunk of the construction has been finished. On Monday Night it was time to lug the cupboards out of the front bedroom and into the kitchen. Drywall was up, the last of the peeling paint was scraped free and Dale had finished off laying the last of the kitchen floor. Some of the pieces round the pipes and back stairwell were a bit of a pain, but nothing a little adhesive couldn’t manage. see Dale smiling? That’s because he doesn’t know what’s to come…. Just because we bought IKEA cabinets doesn’t mean we have to use their on-line layout software does it? Bah, what’s the fun in that?! What ever happened to doing things the old fashioned way? Okay so not the best idea, but we couldn’t wait. There comes a point when you need to get over the demolition hump and do that last push to make you feel like you are getting somewhere with your project. We needed to see the kitchen realized before we locked the doors and headed back to the city. 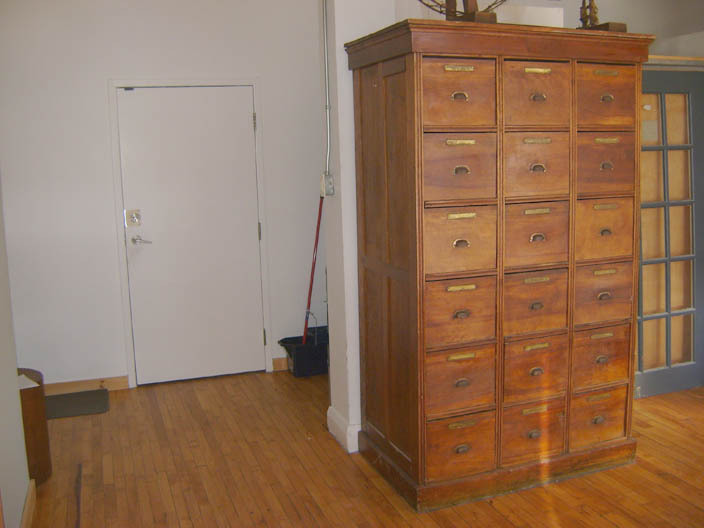 And the debate is still on as to whether or not to put in our 1800’s cabinet on that wall between the stairwell and the bathroom or leave it empty. So beautiful, so sensible for storage, but a real beast. We are going to go with floating shelves above the counters, and so far are planning to use subway tile for the back splash since it went so well upstairs…not sure if we will go for a clean white tile or something in a natural tone that picks up on the flecks in the stone of the counter top. I’d be happy with this sort of a finish, and I am pretty sure we even have that hanging light kicking around in storage someplace, ha. Did I mention Dale has to pull up part of the flooring and move the plumbing/drains and electrical to the opposite side of the room to realize my vision? By the end of the first weekend the cupboards were torn out, the walls were scrubbed clean, the trim had been painted glossy white and 3/4 of the new kitchen floor was laid. When I say cheap, I mean cheeeeeeap. We got enough of this flooring to do the kitchen and the entire 3rd floor attic space, and guess how much it cost? go on, guess…$200 for a thousand square feet. yup! 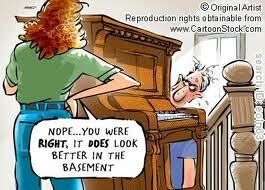 When you are on a tight budget it makes sense to look for things in unlikely places. Ikea has some click flooring on for $1.49. You can find some options at Home Depot for as low as 89 cents, but it’s pretty crappy stuff. Our wide plank, distressed hickory flooring was found searching local kijiji ads. 20 cents yo!! Laminate flooring goes down super easy so you can also save on the instillation costs and give it a try yourself. All you need is a level surface underneath, a roll of plastic underlay, wood block & mallet, tape measure, pencil and a chop saw (which you can easily rent). It goes much faster if there are two of you laying the floor, one on hand and knee fitting while the other cuts and makes the board selections. These dudes do a pretty great job of showing just how easy and fast it is to do a room. Watch and learn. There are usually 6 or 7 distinctive patterns in each batch of laminate boards. You want to make sure they are staggered so you don’t end up with an obvious repeating pattern, nothing screams tacky like being too matchy matchy! Use a wooden block laid horizontally against the ends of your boards that you are tapping into place. It will absorb the force of the mallet and keep your boards from splitting. You can use any old scrap of wood and a regular hammer so don’t go buying some silly specialty tapping block setup. If you are the kneeler do your old bones a favour and grab a gardening pad from the dollar store. You will be using it for other handy jobs so it’s a pretty great thing to have around and this little tip just saved you 12 bucks so next round of coffee’s on you!